There are several kinds of paper cutters you can use in a print shop. 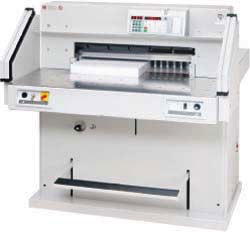 If you are doing large projects with volume cutting, a large hydraulic or electric paper cutter is what you need. If you are a UPS Store or Mailbox store, a good manual cutter is what you need. If you are trying to cut up to 360 sheets of paper at once, you can still do it manually without taking up a lot of desktop space. There are several manual guillotine paper cutters on the market. 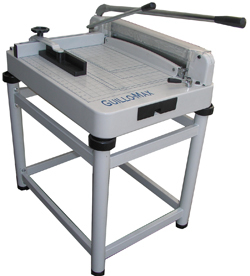 The one we find useful and can handle big jobs for a small shop is the Tamerica Guillomax Guillotine Paper Cutter. First, position the paper on the cutter and then clamp it in place so it stays while you’re cutting. It is the primary feature of any electrical or hydraulic cutter. Anyone who has cut a lot of paper knows how easily it can shift during cutting, creating those almost diagonal cuts as the paper slides out from under you. It’s annoying. Very annoying. The handle-weighted clamp on the Tamerica Guillotine Paper Cutter stops that from happening. Once you’re ready to cut, double check your fingers are safely out of the way. That blade is sharp. Then, with one, strong stroke, bring the Guillotine’s massive blade down on your neatly stacked pile of paper for a nice, clean and even cut. 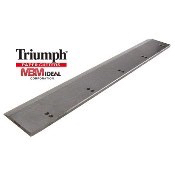 It can cut up to 17” in length and takes up a mere 16.5”x17” of table space. It weighs an impressive 81 pounds and is made for heavy-duty work, meaning it will stay in place on any job. The cost is a negligible $450 when you consider the cost of a big electric or hydraulic cutter. If you are a small print shop or UPS Store, the cost and application are a perfect fit for you. You can check it out at our store.